Then add tomatoes, sugar, fish sauce and dried shrimp seasoned with lemon juice to taste. The taste is sour, sweet and salty (combine) then put roasted peanuts. Put the fried papaya salad on a plate. Serve with fresh vegetables taste different. “To prepare Thailand’s most famous salad, pound garlic and chilies with a mortar and pestle. 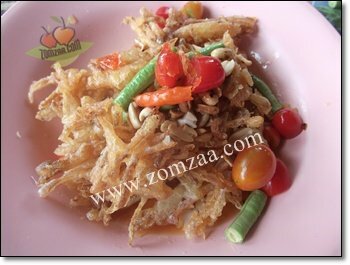 Toss in tamarind juice, fish sauce, peanuts, dried shrimp, tomatoes, lime juice, sugar cane paste, string beans and a handful of grated green papaya. Grab a side of sticky rice. Variations include those made with crab (som tam boo) and fermented fish sauce (som tam plah lah), but none matches the flavor and simple beauty of the original” .